Bed bugs are flat, reddish-brown, oval insects up to 4 to 5 mm long or the size of an apple seed. They are normally swollen and reddish after a blood meal. Bed bugs only feed on blood. 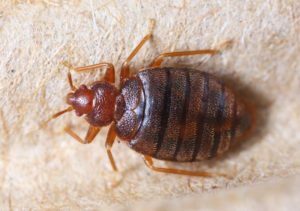 Under cool conditions, bed bugs have been able to survive up to a year without a meal. They prefer to be more active at night when the host is asleep. Remove all clutter from your home, which makes finding bed bugs easier. Wash and dry your bed linens on the hottest temperature permitted. Closely inspect any second-hand furniture before bringing it in your home.